How to recruit on Facebook is one of the most common questions asked by recruiters who want to get into social recruiting. The simplest answer is: Do it like it’s 2018! Meaning, use all the features, newest trends and best practices that Facebook recruitment has to offer. Here is my step-by-step guide and best examples of new trends in Facebook recruiting. Because of all the new trends in the HR industry, the way we recruit has changed. One of the biggest trends in recruiting over the past few years has been the use of Facebook to attract and convert talent. This practice even got its own buzzword – “Facebook recruiting”. So what is it exactly and how to do Facebook recruiting #likeaboss? Check out our free Guide About 15 Recruitment Trends to Implement in 2019! Facebook recruiting is a social recruiting method that is a part of Recruitment Marketing. When we say Facebook recruiting, you probably think of posting your job ads on Facebook. Everybody does that these days. But Facebook recruiting is not just posting your job ads on Facebook! If you want to know how to recruit on Facebook, how to stand out and attract top talent, you need to go a lot further and develop a strategic social recruitment plan. Luckily, Facebook is a great tool with a ton of options that can really take your social recruitment strategy to a whole next level. Why Facebook and social recruiting rocks? The benefits of social recruiting are numerous, and Facebook has become one of the most popular social recruiting platforms among HR professionals. But why is Facebook recruiting so popular? What are the benefits of Facebook recruiting? The first benefit of Facebook recruiting is related to its size. Facebook is the largest social network site in the world: it has over 2.07 billion monthly active users (Source: Facebook 11/01/17). That means that everyone is on Facebook. All of your ideal candidates are there. Even their moms are probably there! 😃 We’re joking a bit here, but you get the point: More people will come across your recruitment ads on Facebook than on any other platform. The second benefit of Facebook recruiting is the possibility to reach a large pool of active candidates. Since finding the right job candidates is one of the biggest recruiting challenges, many HR professionals put a lot of time and effort to research which channels are the best to look for talent. Although you might expect that active candidates (the ones who are actively looking for a new job) would choose LinkedIn as their #1 go-to-site for identifying job opportunities and spend most of their time there, it is not so. Active job seekers actually prefer Facebook - research "Job Seeker Nation Study" shows that there are more job seekers on Facebook than on LinkedIn! The second benefit of Facebook recruiting is the possibility to reach passive candidates. Passive candidates are those candidates who are not actively looking for a new job but would be willing to accept a better offer. Remember, a better offer doesn't necessarily mean more money. It can be a flexible working time, education, opportunities to grow, benefits, cool projects, and many others. Facebook recruiting is a great way to get in front of these people. By using social recruiting methods you can show potential candidates that you are an employer who fits their interests and preferences. Because of this, social recruiting is invaluable if you want to encourage your ideal candidates to make a move or at least start considering a new job at your company. Facebook recruitment goes beyond posting current vacant jobs ads on your company’s Facebook site. Facebook recruiting offers so much more! You can use Facebook to proactively search for potential candidates, build relationships with them and encourage them to apply to your vacant job positions. Take your Facebook recruiting strategy to a whole new level: follow our step-by-step guide and learn how to excel in Facebook recruiting! You can use Facebook to source, attract and hire new employees! Facebook recruitment offers a great, but underutilized opportunity to proactively search for candidates. Did you know that you can use Facebook as a proactive sourcing tool? You can find potential candidates using Facebook search option - and you don’t even need to have a company Facebook page to do it! You can use your own, personal Facebook account to proactively search for potential candidates when Facebook recruiting. Have you checked our guide for finding high-quality job candidates? Facebook recruiting makes it easy to target your ideal candidates. This is because Facebook has a powerful built-in search engine, called Graph Search. 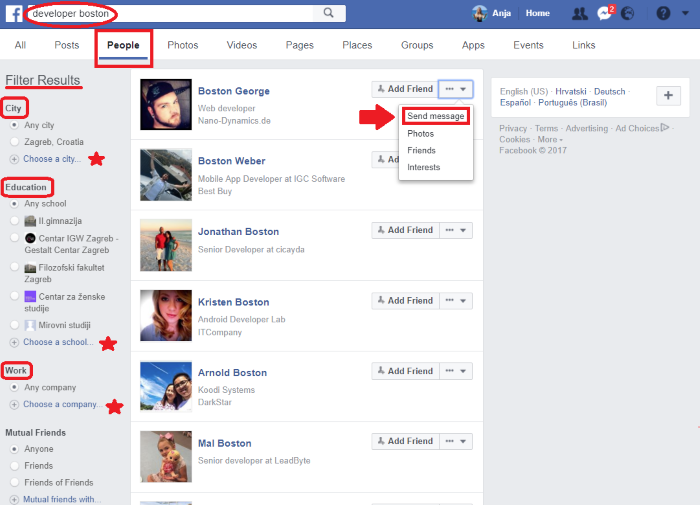 Graph Search utilizes publicly-available information listed in Facebook users profiles. Many Facebook users share a lot of information on their profiles, including their location, education, work experience, (current or past) employers and even languages they speak. Facebook Graph Search allows you to find candidates who meet specific criteria using filters (e.g. city, education, company etc.). Let’s say your company is located in Boston and you’re looking for developers. How can you use Facebook recruiting to find your ideal candidate? Go to your Facebook homepage, locate the search bar at the top, and type in a query: “developer Boston”. Click the search button and voila - view your results! *Just make sure to choose the “People” tab when viewing your Facebook recruitment results. Once you find your candidate persona, you can use their names to screen them in more details on LinkedIn and Google. If you find a right match, you can reach out to them through LinkedIn or even directly on Facebook. You can invite them to like your company’s Facebook or LinkedIn page and send them a message with your Facebook recruiting job ad. Your company probably already has a Corporate page which you can use for Facebook recruiting. But you can also open a new account and create a completely new profile - your company’s Career page. Why is it good to have a separate Career and Corporate Facebook page? Because the purpose, audience and message you deliver on those two pages should be different. On your Corporate Facebook page you talk to your customers, and on your Career Facebook page you talk to potential employees. This is why big companies who excel at Facebook recruiting have both Corporate and Career pages on Facebook. Let’s take a look at the company who’s doing social recruitment right - HubSpot. Notice that they didn't call their Facebook Career page just “HubSpot Careers” as many other companies would. They call it HubSpot Life because their goal is to show the world how is it to be a HubSpot employee. If your company is too small and you don’t have enough time and resources to manage two company Facebook pages, don’t worry - you can still utilize your existing Corporate Facebook Page for social recruiting. Keep reading to find out how! The next step in learning how to recruit on Facebook is to learn how to show off your company culture. Research has proven that companies with strong Employer Branding strategies are more successful in attracting the right candidates. If you display a great culture within your company, people will want to become a part of it! Social recruitment offers a great opportunity to give potential candidates a glimpse of what it’s like working at your company. Use Facebook recruiting to let potential candidates see how your business operates and what your company looks like beyond the typical flashy brand advertisements. Post photos and videos which show what it’s like to work at your company. Facebook makes it easy to be visual with your storytelling. People want to be able to envision themselves working for companies, so when it comes to Facebook recruitment, photos really are worth a thousand words. So without further ado, let’s take a look at the best practice examples of showcasing company culture in Facebook recruitment! Share their testimonials and experiences, like Chipotle, a company that also excels at Facebook recruiting. Celebrate their success like Disney, one of the Facebook recruiting pioneers. And make sure to highlight their team spirit! ...and that sweet, special moments and celebrations! You can also present your educational events, interesting and cool projects your team works on, awards and recognition you won (especially “Best places to work” recognition) and any additional perk you offer to your employees (for example, pets allowed, cafeteria, in-house yoga classes etc.). These are all great Facebook recruiting ideas you can use to showcase your own company culture! Now, let’s dig into the creative ideas and Facebook recruitment ad hacks that will send your 2018 social recruiting campaigns over the moon! When writing a Facebook recruiting job ad, writing a job description that attracts the best qualified candidates for your job opening is a must. So, what are the key steps to creating a compelling Facebook recruitment job ad? When writing a Facebook recruiting job ad, start by considering your tone of voice, which should be a reflection of your business’s personality and the vacant position you are looking to fill. Should your candidate be funny? All suit and tie? Adventurous? Passionate? Every company has its own identity and values that they appreciate the most in their employees. The more authentic you are, the more effective your Facebook recruiting ads are likely to be in attracting “your kind of people” candidates. At the end of the day, the goal of every job ad should be to showcase your company’s Employee Value Proposition. Next, find or create an eye-catching image. This is very important when it comes to Facebook recruiting! Try not to use stock photos because they come off as an impersonal and artificial. If you don’t have the budget for a professional photographer, don’t worry - you can take great photos using your smartphone. Just pick an interesting subject (e.g. your employees), pay attention to the angle and lighting, and don’t be afraid to use apps or filters. Also, once you take your photo, consider cropping it so it’s framed nicely. Following, think of a great copy for your Facebook recruitment job ad. This is your chance to communicate your key message in an inspiring way that will make potential candidates eager to work at your company! The copy of your Facebook recruitment job ad should be warm and inviting, yet specific with all the needed information (e.g. job position, location, education and skills and benefits you’re offering). Remember, less (text) is more, so KISS your Facebook recruitment job ad (Keep It Short and Sweet). In the end, don’t forget to add the link that leads directly to a job listing. Making your application process simple, short and easy will increase your chance of getting more applications via Facebook recruiting. Single or a bulk Facebook recruiting ad? 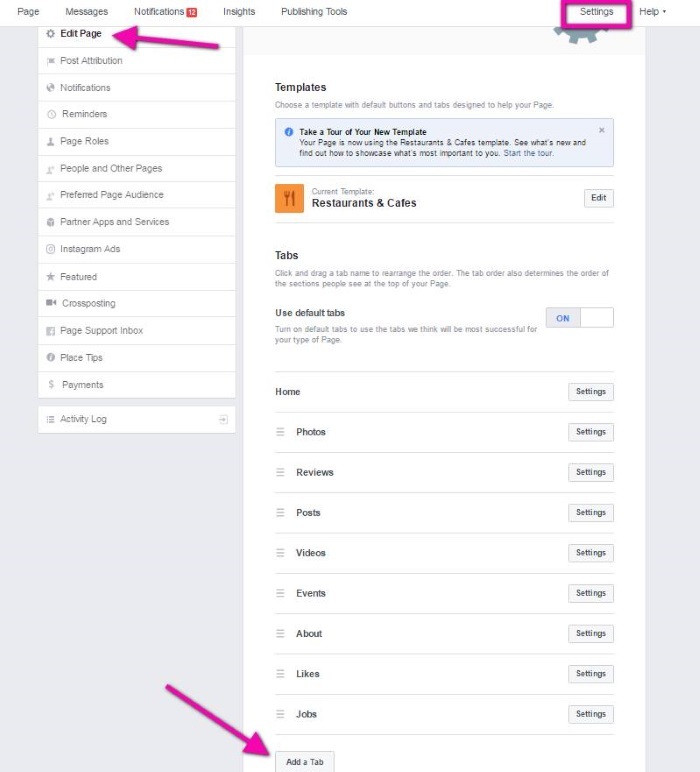 If you have more openings at the same time, you can create a separate Facebook recruiting ad for each position (e.g. We are hiring a front-end developer) or a broader, general one (e.g. We are hiring, check out our open positions). Using a general Facebook recruiting ad that promotes all your openings in one Facebook post can save your time and money. Still, if you have a certain position that is very hard to fill, we suggest creating a specialized Facebook recruitment job post for it to make it stand out and attract more attention. How to make your Facebook recruitment job post stand out? Don’t be afraid to get creative and inject some personality into your Facebook recruiting efforts! Wondering how? Consider thinking in terms of your ideal candidates’ mindset and what might appeal to them. Put yourself in their shoes and think “what would make me like this job at this company?” And remember, not all recruiting requires a suit-and-tie vibe. especially when it comes to social recruitment. It’s OK to use humor and emotions to encourage interested applicants to click on your Facebook recruiting job ad. Now that you created your Facebook recruitment job ad, it’s time to share it! Of course, you can share it on your company Facebook page, but how to broaden your search and reach potential candidates who aren’t fans of your company’s Facebook page? Let’s have a look at the 3 most important additional channels you can use to promote your Facebook recruitment job ads: Referrals, Facebook groups and Marketplace. Oh, and the best part? All 3 of them are completely free to use! First Facebook recruitment channel worth mentionign are employee referrals. Employee referral programs work great when Facebook recruiting. First, it’s by far the easiest possible way for your employees to share your job ads - they can do it with just one click and reach all of their family members, friends and colleagues network on Facebook. The second reason why referrals work wonders is because they increase the quality of your applicants. If your candidates know who their potential coworkers are and have an idea of what is it like to work at your company, you’ll probably get the best matches for your company culture. Second Facebook recruitment channel that is very useful, but underutilized are Facebook groups. Facebook groups are places on Facebook where people with common interests gather and share ideas. There is a Facebook group for literally every topic you can imagine, but let’s start with 3 main subtypes: hiring groups, interest groups and student/alumni groups. Hiring groups are groups created with the aim of offering and finding vacant jobs, so they’re a logical place to start. But don’t forget to utilize the specialized interest groups too! When it comes to interest groups, focus on the specific industry or occupation. Oh, and if your opening is an entry-level position, make sure to share it in a student or alumni groups. To further narrow down your search, add a specific location as a criteria (e.g. a specific country, city or even a college) to your Facebook recuitment search. That being said, where do you find these groups when you're Facebook recruiting? Go to your Facebook homepage, locate the search bar at the top, and type in a query (e.g.) “Jobs London”. Click the search button and voila - view your results! *Just make sure to choose the “Groups” tab when viewing your results. Finally, totally underutilized, but extremely effective Facebook recruiting channel - Marketplace. The marketplace is a convenient destination on Facebook to discover, buy and sell items to people in your community. Although at the moment Facebook Marketplace doesn’t offer “jobs” as a specialised category, users are already using it for finding job candidates. It will probably evolve over time and become a really big thing in Facebook recruiting in the near future, so it’s worth keeping it in mind. Never heard about this Marketplace and wonder where to find it? Again, Go to your Facebook homepage and locate it on the left. Click on it and when it opens, you can easily search or create job ads. It’s time to talk about Facebook recruitment paid ads. Promoting your Facebook recruitment job ads does call for a budget, but if done correctly, investing just a few dollars in promoting your Facebook recruitment job ad can really pay off big time! So let’s dig into the Facebook Recruitment paid ad hacks that will send your 2018 social recruiting campaigns over the moon! “Boosted” or “Promoted” Facebook recruitment job ads: Which are better? First, you need to know the difference between these two types of Facebook recruitment job ads. A “boosted” Facebook recruitment job ad is the most basic advertising you can do on Facebook. It basically means paying a bit extra to widen the reach of the selected post published on your page’s timeline. All you need to do “boost” any of your posts (e.g. your Facebook recruitment job ad post) is to click Boost Post button in the lower right corner of your post. “Promoted” Facebook recruitment job ads are a more advanced way to advertise on Facebook and they require a use of a Facebook Ads Manager account, but they offer more targeting options, as well as the ability to create your audience from the scratch (using your imported contact lists), adding calls to action (e.g. “Apply now” button) and creating dark posts. But let’s take it step by step. First, lets' explain targeting in Facebook recruitment! Why Facebook ads work so well in recruiting is because you can specify exactly who you want to reach. The targeting option lets you select location, age, education, interests etc. of the people you want to reach. “Custom Audiences” option even lets you create your own, customized audience by importing your contact lists. Inputting contacts from your ATS or networking events is a great way of continuing contact with potential candidates and convert them into applicants. This is a very, very fun type of Facebook recruitment ad! It’s also called “the invisible ad” because although you use it for advertising, it doesn’t show up on your Facebook page timeline. This is especially handy if you’re using your company’s corporate Facebook page for recruiting because it allows you to set up multiple posts for a different audience. This means that you can run your paid “Promoted” Facebook recruitment job ad without that post showing up (being visible) on your company’s corporate page timeline! Use it when you don’t want to bother your customers with your job ads. Facebook Live streaming makes it possible to interact with your potential candidates in real-time via live chats or videos. And the best part of this highly effective Facebook recruiting tactic is that you don’t need any extra apps or video editing software - only your smartphone! And did we mention it’s completely free? You can organize so-called “Career Chats” - live chat sessions on your company’s page. The best way to do it is to create an event and host a chat there, by posting on the event wall. Have a few members of your hiring team and/or your employees answer candidates questions in real time and offer helpful advice on applying and being hired at your company. Live video session is a unique opportunity to introduce your team, give a tour of your office and answer candidates questions in a real time and in a really engaging and fun way! How does it work? Your video appears in your followers’ news feeds and you get live feedback on the number of people watching. You even get to see their comments as they come in! Oh, yes, and when the broadcast is over, a recorded version of the video will automatically be added to your timeline. L'Oréal Career page called L'Oréal Talent does both chat and video live session in style. Watch and learn about their great Facebook recruitment ideas! Did you know you can now add a “Jobs tab” on your Facebook career or Company site? Oooohh, yeeees! Facebook for Business just recently rolled out a new feature that allows page administrators to create job posts, track applications, and communicate with interested candidates. This is one of our user’s, Rimac Automobili, Facebook jobs tab. Head over to your company’s Facebook page. Find the “Settings” button at the upper right corner and hit it, then look for the “Edit Page” button in the upper left corner and click on it. Then scroll down to the bottom of the page where you’ll see the “Add a Tab” button. Click on it and voila - you’re ready to publish job postings on your Facebook Page Job Tab! This is a new feature just rolled out recently, so it might not be available to you yet (at the moment, it’s only available in U.S. and Canada). For other countries, there are third-party apps such as Facebook Job Tab by our TalentLyft that perform a similar job. Candidate engagement has become one of the most important recruiting metrics. Facebook is the perfect way for building two-way communication, so it’s a perfect choice to engage in meaningful conversation with potential job candidates. In addition to engagement, candidate experience is a huge driver of a successful recruiting campaign. Timely responses to the questions, queries and comments on your Facebook careers page extremely important when it comes to providing an exceptional candidate experience. Time is of the essence here! If you appear inaccessible, your potential candidates might be discouraged to pursue your job opening and go for the job opportunities with another company. Don’t just stop at answering direct questions and queries. Be proactive in your Facebook recruiting efforts! Start interacting with your Facebook fans’ general comments, too. Each and every interaction a Facebook user has with your page is an opportunity to convert him/her into a prospective hire for your business. So seize every opportunity! Always use a personalized approach if you want to excel in Facebook recruiting. First, personalize your own voice. Be authentic and develop your brand’s unique voice and style of communication. Make your answers sound like something a real person would say, not like you’re a just copy-pasting robot like template answers. Second, personalize your approach to Facebook users. Treat them with respect and rely heavily on your human empathy and kindness. Remember, behind each and every Facebook question or comment is a real person (a potential candidate) reaching out to you. Learn from Marriott Hotels, a brand that does Facebook recruiting perfectly on their Marriott Careers Facebook page. Your Facebook company page, especially your Career page if you have one, offers you a unique opportunity to prep your potential job candidates. Make it easy for them to learn about your company, your hiring process and introduce them to your hiring team. Being well informed about your hiring process and expectations will help job seekers feel more relaxed and confident, thus making their candidate experience with your company more enjoyable. Also, by offering them all the relevant information in one place you save their time and energy and keep their interest focused on you. If they had to research your company and industry by googling, they could easily navigate right to your competitor site and end up applying for their job openings! Don’t post random articles on nailing the interview, great resumes etc. Instead, add value for the job seekers by creating and sharing useful information, like tips and tricks from your own hiring team. Show them how to apply and/or interview with your company more effectively and help them land the job of their dreams! So should you do Facebook recruiting? Facebook is and will continue to be a powerful recruiting tool in 2018. Facebook recruiting is already the most effective form of social recruiting, and with new features rolling out and new trends emerging, we can expect a lot of new opportunities for recruiters, HR professionals, business owners and small business CEOs to connect instantly with thousands of high-quality candidates through Facebook. It’s up to recruiters to leverage these possibilities of Facebook recruiting in the best way possible. We hope this guide will help you do exactly that. P.S. If you need any help recruiting candidates on Facebook (or you want to set up a beautiful job tab), try out our services for free! Once you are in the free trial (14 days, no credit card required, unsubscribe at any time), you can let our team know about your needs in the live chat.